Sr. Maria Scholastica – Orsola Rivata, first Mother of the Sister Disciples of the Divine Master, was born in Guarene (CN – Italy) on July 12, 1897. At the age of twenty, Orsola understood that the only treasure worthy of spending her entire life for was the Lord. Therefore, she made her declaration of unconditional love to him: “Lord, You alone are enough!” which she would observe in her daily life, in fidelity forever. On July 29, 1922, accompanied by her father, she began the adventure that would lead her along the unsearchable ways of the Lord. Father Alberione, who in 1914 had founded the Pious Society of Saint Paul with two young boys, already had a sizeable group of apostles of the good press. Since 1915, there was also a group of young women who, only the week before, were officially established with the name of Daughters of Saint Paul. Orsola received the program given by the Founder to the entire work: “Glory to God, peace to mankind”, to diffuse the Gospel with the modern means, which at that time consisted primarily in the press. It is certain that “in the House, every occupation, whether cleaning vegetables, preparing meals, washing and ironing laundry, was finalized toward this purpose. Belonging to one body in Christ led all to work toward the same goal. 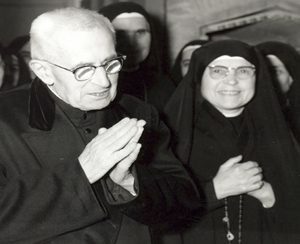 After her entrance into the newly established Pauline Family, Alberione gave her the name of Sister Scholastica, which means disciple, and chose her as his collaborator to give life, in 1924, to the Congregation of the Sister Disciples of the Divine Master. 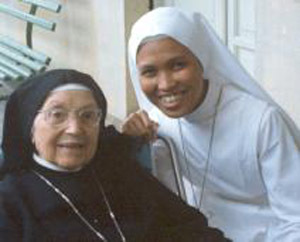 A woman without degrees or diplomas, but with the wisdom drawn daily at the font of the Eucharist and of the Word of God, she led by example and dedicated all her best energies to the formation of the first generations in the specific mission of the Congregation, communicating the beauty and fecundity of the apostolate with joyful enthusiasm. 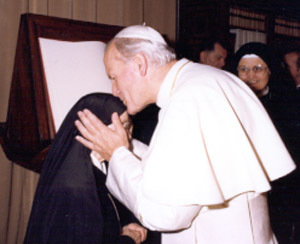 With her heart open to the entire world and understanding the language of youth, Mother M. Scholastica, drew near, with the love of an apostle, to every anxiety and joy of the men and women of every continent. She also demonstrated this by bringing a newspaper, which she often carried under her arm, to present everything to the Divine Master in her Eucharistic adoration. She was able to listen to all, brothers and sisters. Her lifestyle was one of silence and hiddenness, but always with the mark of a “woman of communication”, open to the present reality of her time and a builder of the future. She died in Sanfrè (CN) on March 24, 1987. On December 9, 2013, with the promulgation of the decree recognizing her heroic virtues, she was declared Venerable.